After the last season of music ended we have had a short break to establish our pizza nights on a weekly basis. Now we are serving pizza every Friday. However in that time we have had multiple enquiries about when the next music nights will be held. You spoke and we listened. So, the next music will be on Wednesday 17th August, followed by a new programme of live acts for you all to enjoy. To kick us off we will be welcoming the fantastic duo Jinski. Recently they appeared live on BBC 1 The One Show and were featured on Channel 4 News. 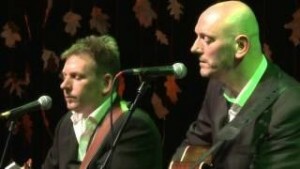 They also just opened for Lindisfarne at The Palace of Arts Newcastle on 3rd June. 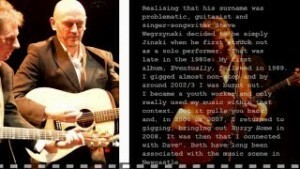 Based in Newcastle Upon-Tyne, JINSKI are song writer Stephen Wegrzynski and musician Dave Kennedy. Their music touches the borders of folk, country, and pop, keeping alive the song writing tradition whilst remaining resolutely modern. JINSKI tell stories that capture the mundane and the magic in everyday life. They have supported O’Hooley & Tidow, Martin & Eliza Carthy and The Poozies last year and headlined the 12 Bar Club in London, also playing on the main stage at Broadstairs Folk festival. They have just supported US band The Grahams on several of their dates last November at The Met Bury & The Musician in Leicester. Check out their Facebook Twitter and Website for more about the band. Tickets are now on sale at the Caffe for only £6, you can call 07956653156 to reserve tickets. The event will run as usual, a specially prepared menu will be served from 7.30pm and music to start at 8.30pm. We hope to see as many of you here as possible for another great night of music at Caffe Portico. We hope you have all had a fantastic Christmas and as we gear up for the New Year we would like to introduce the upcoming events. Our Pizza night has been hugely popular and will now be running more frequently. The next evening will be on the Friday 15th of January. Following will be the Friday 29th January and Friday 26th February. We will also be hosting a Gourmet dining evening with guest chef Phil Cooke on Friday 12th February. Please contact Sim for details on our events and to book on 07956653156. The Secret Supper Club will be making a come back on Friday 19th February; those on the mailing list look out for your invitation and those who wish to be added to the list drop your email into the caffe. Wishing you a very Happy New year and see you in 2016. New Years Eve At Caffe Portico with the Ben Havilah Revolution! Ring in the New Year in style and comfort with us at Caffe Portico. Come join the Party and be treated to an authentic Italian dinner and music courtesy of The Ben Havilah Revolution. Tickets for this event will only be £7.50 a person and dinner from £15.95. Come as a couple or a party, all are welcome to celebrate 2016 with great food and company. Tickets are going fast so let us know as soon as you can if you would like to book. We will be taking reservations at the Caffe, on Facebook; by commenting on the event, or by calling 07956653156. Comments Off on New Years Eve At Caffe Portico with the Ben Havilah Revolution! The Christmas Market is a magical time when Lincoln is transformed into a Winter wonderland, thousands of people crowd the streets and its almost impossible to find anywhere to sit, eat and relax. Here at Caffe Portico we want to save you from the hustle and bustle of the packed streets and only a few steps from the High Street you will be able to enjoy the smoky, rustic taste of authentic Italian Pizza at only £10 per person. The fires of the Wood Fired Oven will be stoked both Friday 4th and Saturday 5th of December so for those who want to escape the throng of visitors and step out the way of the waves of people drop in on us for a take away Pizza or a relaxing sit down meal. To book a table you can either call the Cafe on 07956653156 or leave a comment on the Facebook event. We look forward to seeing some new and familiar faces for a night of good food and good company. Once again the fires will be stoked in our very own wood fired oven, and you will be able to enjoy the smoky, rustic taste of authentic Italian Pizza at only £10 per person. For all those who missed last months pizza evening we invite you on Friday the 23rd to join us for this great evening. To book a table you can either call the Cafe on 07956653156 or leave a comment on the Facebook event. We look forward to seeing some new and familiar faces for a night of good food and good company. So it seems that the summer Jazz at Café Portico has come to an end, however there is still lots to look forward to in the coming months! Sim’s wood fired Pizza oven has been a great success and we look forward to hosting another pizza evening on the 28th August, so if you’re a fan of real Italian wood fired Pizza at only £10 per person you’ll love an evening at Caffe Portico. There is plenty of time to book a table so drop into the caffe or call 07956 653156. But as we all know when September rolls around we’re all feeling the post summer blues, luckily we will be announcing the forthcoming line up of Jazz and other live events for the coming months and in addition the unveiling of a new and improved menu, plus the caffe is always available for private parties and events. And as always we are open for delicious breakfasts and lunches, or a relaxing coffee and cake. Comments Off on Summer Update! Nathan’s career as a musician began with just him, a guitar and a unique, stirring voice that landed him support slots with Mercury Prize winners alt-J, Gabrielle Aplin and Sony RCA’s recent signing Amber Run. Following a summer of packed-out festivals – including The Great Escape, Isle of Wight, Boardmasters and Camp Bestival amongst the eleven – Nathan has just released his debut EP Echo. D rawing inspiration from his beloved Cornish coastline as well as the vast landscapes of Foals, Bon Iver and Daughter, Nathan and his band are crafting raw and surging compositions. Finding his feet in the depths of the sea, cold-water soul Nathan weaves dark acoustica with electrifying instrumental scores. Taking the UK by storm, fabulous Lincolnshire based emerging vocalist Shannon Reilly is joined by guitar virtuoso Pat McCarthy and fine bassist Warren Jolly. “This is superb music that manages to pull off that difficult trick of having a broad appeal whilst still satisfying the jazz connoisseur” – Gill Wilde, Jazz Promoter of the Year. “The most talked about gig of the week” – John Holland, New Jazz 5. With Nicola’s trio you get a lot of musical talent for such a small band. It comprises of voice, tenor sax, piano, double bass and drums and with Piero Tucci – “a jazzer’s dream, as unpretentiously skilful on keys as he is on sax.” Sandman magazine – and the intense and propulsive drumming of Phil Johnson, these three musicians combine to give a performance that will startle you with its genuine love of music and melody. They all aim to enjoy themselves fully, to entertain joyfully – and to swing yer socks off! Supporting Tony will be local drummer and young bandleader Andrew Wood, along with his piano trio, showcasing three of the finest jazz musicians and improvisers in the region. On double bass, Martyn Spencer, an outstanding bass player and musician with performance credentials including Lady Gaga, Caro Emerald and the Paris 1940s. Derbyshire based pianist Matthew Ratcliffe completes the trio line-up, bringing a wealth of experience and talent; Matt visited Portico back in November with his organ trio and we’re looking forward to welcoming him back.